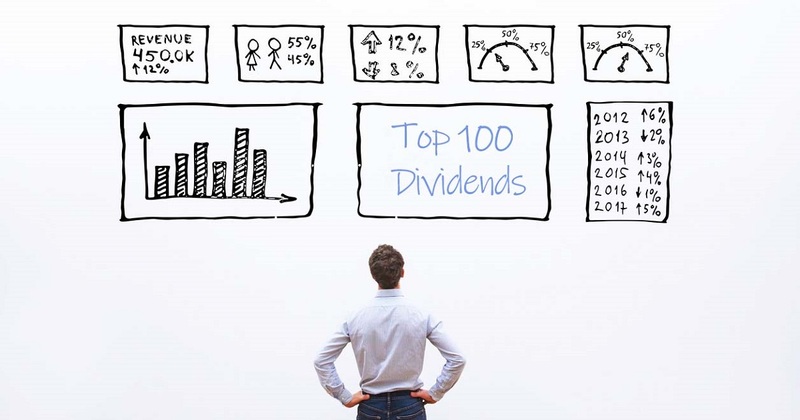 Our top 100 dividend stocks list below ranks stocks based on yield, dividend growth, net income growth, cash flow yield, payout ratio and one-year return percentage. This top performing dividend list is based on historical performance and does not indicate how a stock will perform in the future. Consult a financial advisor before making an investment decision. The best dividend stocks consistently grow and pay dividends. As a result, their stock prices rise and provide capital appreciation to their shareholders. Capital appreciation is often overlooked when evaluating dividend stocks. The best dividend stocks are those that pay a high yield and rise in stock price. We base our ratings off of the values of each column below. We’ve left these number in the chart so you can see how they rank for each data point. To get a better understanding of our rating system and definitions for the terms below see the bottom of the Top Dividends page. If you are looking for the highest yielding stocks take a look at our high yield stocks page where we have dividend stocks sorted by yield. The stocks on that list range from 4-25%. When looking at the highest yielding stocks be sure to pay special attention to the dividend history and payout ratio. When a stock is yielding far and above its 5-year dividend average it’s important to determine why the yield is so high. It may be because the stock price has been driven down which forces the yield to go higher. This high yield may be temporary the if the stock price has been pushed down because income is slowing. That is why we include the net income growth rate and payout ratio in our premium dividend data. We give special preference to dividend stocks with a 3-year net income growth rate over 5% (10% gets our top rating) and with a payout ratio below 60%. REITs are excluded from the low payout ratio requirement because they are required to pay 90% of their income to shareholders. The best dividend stocks aren’t those with the highest yields. They are stocks that provide steady dividend growth and capital appreciation for shareholders.